For gentlemen, regardless of nationalities around the world, the active and outdoor lifestyle has also been the preferred way of life. It’s hard for all of us to sit in one place for a prolonged period of time. And without moving some muscles or release the contained energy within, things will eventually become boring or irritatingly uncomfortable for us. But it doesn’t come with a price: When we’re partaking in outdoor activities, perspiration is going to be a problem. And the unpleasant smell it brings can take a huge toll on your confidence, and maybe even off putting to those around you. Which is why, in this article, we’ll bring you some of the best options available for a good bottle of deodorant for men. The first and most important thing to choosing the best kind of deodorant for you is to understand what it is. It is a very common phenomenon among consumers to mistake Anti-perspirant and Deodorant. While most believed they are synonyms, they are completely different things. While anti-perspirant works by affecting the sweat glands in the area that you’ve applied it to and reduce the amount of sweat. Deodorants work by eliminating the bacteria that feast on the sweat and produce the unpleasant smell in the process. Deodorants work best when you’re not prone to sweating and it’s mostly the odour that is being the problem for you. And vice versa, for those who are profusely sweating, their best bet would be anti-perspirant. There is a host of problems associated with using anti-perspirant. From yellow stains on your clothes, to excessive sweating when your body tries to circumvent the clogged sweat glands. This is the main reason why deodorants are the simplest, and most effective way to remedy an active life. Depends on each person’s body, it is vital that you choose the correct formulae for your personal deodorant. Some people sweat more than others, and underpowered deodorant not only won’t help, but it’ll also waste your time and money. You have to know your body first before making any purchase. That is not only from your body’s condition, but also whether you’re allergic to any ingredients or chemicals in these bottles. It is only by completing this check list that, gentlemen, you can find the best deodorants for men. If you know you sweat a lot, you can choose the stronger variants with 20% or 30% concentration of Aluminium Chloride. That is the main chemical responsible for plugging the sweat glands to stop the uncomfortable smell. And if you’re allergic, you can always opt the organic (All natural) option. Although it is much more expensive, that is the only option you have. Gel deodorant is a clear and cool compound that you apply directly to the area you want for it to work on. Although they’re a bit sticky and you have to wait for a period of time to let them dry before putting on your clothes. They’re light, and since they’re translucent, they won’t make a mess on your clothes like other types. Spray is one of the well known type out there. They come in a spray bottle. You only need to point the nozzle at the desired area, press down, and it’ll be done. 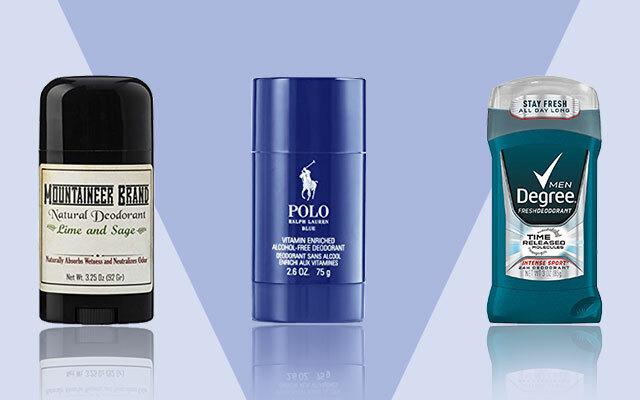 Deodorant sprays are especially useful for men who have a lot of underarm hair. The speed of the spray will infiltrate better into the skin levels than other types. This is arguably the most popular deliverance method. The compound is delivered in the form of a roller that you drag across the skin of the area you want to clean. Sticks are considerably more soothing on the skin, especially those with sensitive skin since they contain dimethicone. It is rarely heard of, and is considered to be more ‘Clinical’ than the three other deliveries. They’re specifically made for those with extremely sensitive skin that cannot handle well gel, spray, or stick. Deodorant creams are usually packed with moisturisers and metallic salts to soothe the skin, and to concentrate effects on it. 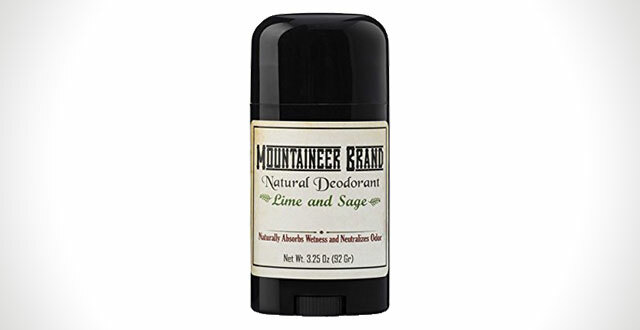 This is the best deodorant for men with sensitive skin in term of delivery method. There is a wide range of potential scents that you can pick out there, but nothing can beat the very classic of a fruity scent. This deodorant from Degree contains just the right amount of perfume for you to smell fresh of lemon and Bergamot orange right away. It also comes with a slight trace of a musky scent, which would bolster your masculinity on the spot. 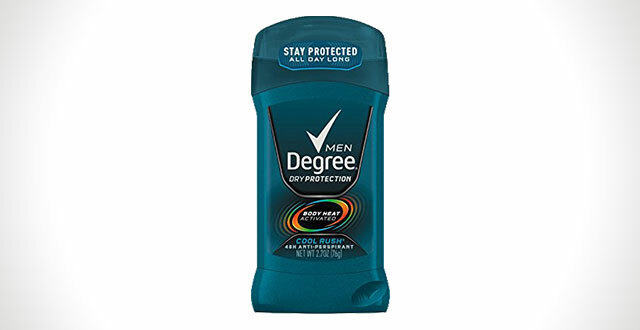 Just like any other deodorants, Degree has quite of an elaborate formulae to keep the uncomfortable body odour at bay. However, what’s best about this deodorant is that Degree has added into it a ‘Time Activated’ formulae. Which means that the deodorant that you apply would release scent slowly throughout the day without pause. Thus, the deodorant’s effectiveness can last for a much longer period of time than many of its competitors. For the harsh, and often intensive activities that men often engage in, this is a God sent feature. Helping it greatly toward the path of becoming one of the best deodorant for men who sweat a lot or are specially active. The deodorant comes in the form of a 3 oz. stick, and thus, can only be applied to your underarms. It leaves no stain on the clothes upon application, unlike many deodorants out there. So rest assured you won’t find unsettling yellow spots on your shirts using this one. But as great a product it is, Degree used to be a better option than it is now. Back in the past, this deodorant contained silver in its formulae to strengthen its anti-bacterial capability. Unfortunately, silver has long been removed, and there are a lot of complaints for it. If you’re looking for silver-based deodorants, this may not be a sound option for you. Fruity and musky scent – a healthy combination between masculinity and comfortability. ‘Time Activated’ formulae makes for a very long effective time in between application. The removal of Silver from the original formulae deteriorates the deodorant’s effectiveness considerably. The chemicals within can be harsh for sensitive skins and can develop into an allergic reaction. One review for the product has reported skin rash after use. When it comes to body hygiene, Dove is among one of the best name for the job out there. And it is not without a reason that it is. With the introduction of the Dove Men’s deodorant, the company really lives up to its name and reputation. One of the best thing about this particular deodorant is the fact that it is specifically designed for men in mind. It does not focus on trying to find the perfect compromise between both sexes. All of the ingredients and compounds within are made to cater entirely to masculine needs. And if you’re looking for the most ‘Macho’ thing out there, the Dove Men won’t at all disappoint. The scent is not overpowering, rather, Dove Men goes for a more subtle and suggestive approach. It’s just enough to be crisp, but not something that would take your senses by storm. There are four scents in total that the Dove Men comes in. The name is quite arbitrary, so be warned if you’re ordering it online: Cool Silver, Aqua Impact, Clean Comfort, and Extra Fresh. The scent can last up to 48 hours at once. This property is especially useful for men who are often on long business trips or excursions and cannot sanitise themselves often. However, the effect mostly depends on how much sweat you produces in the day. For those who sweat a lot, the effective time for the deodorant is reduced to 12 hours only. Take that in mind if you know you’re part of this group. Beside the enduring odour protection, the deodorant also comes with an effective moisturising formulae. It is advertised to also be forgiving on sensitive skin. And from the hundreds of positive reviews that it had garnered, it held up to its claim well. A singular Dove Men deodorant stick is 3 ounces. Available in a wide selection of scents. Does a good job at skin moisturising. Pleasant even to sensitive skin. The scent may be too faint for some. Why Dove is known for its exemplary products on personal hygiene, Gillette is synonymous for men’s personal care. The brand is famous for its long standing razor product. However, they also had a lesser known, but still very much effective deodorant line. When it comes to Gillette, they aim more toward the male audience. 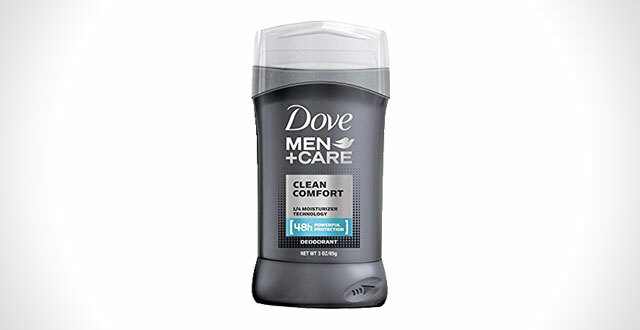 The deodorant itself, much like the Dove Men, is not meant to be unisex. If you’re looking for something to make yourself stand out as a true, hygienic gentleman, this is one of your best shot out there. Unlike Dove Men, Gillette stresses much more on the scent of the product than the former. The scent is very pronounced, in fact, it could easily pass as a cologne substitute. So you ought to be quite careful applying it so that it won’t come off to be overwhelming. For their line of product, five scents are available beside Cool Wave: Sport, Arctic Ice, Power Rush, and Brisa Tropical scent. The names are, much like Dove Men, is arbitrary and does not really convey to you what you should expect when you put money in one. So you ought to be very careful while making a purchase. The scent can last for a total of 48 hours, as beside being quite good of a deodorant, it is also an antiperspirant to boot. This can reduce the total amount of sweat being released. Even if you’re prone to sweating, the sweat glands will be controlled strictly. Your body is ensured to stay clean for the entirety of the 48 hours as advertised with the Gillette. The ingredient contains active Aluminium and Zirconium, which may cause some yellow stains on your clothes. However, the formulae addresses this problem well enough for the hundreds of customers to not have troubles at all. This antiperspirant – deodorant mix comes in the form of clear gel. Although it is a great plus that your clothes won’t be stained with white, messy traces like other gel based products. However, it still retains the main, age old problem with gel is that it can be quite messy and difficult to apply. Choose wisely. Available in many scent options (Five). Long effective time: 48 hours. Will not cause yellow stains on clothes. The gel can be difficult and messy to apply. 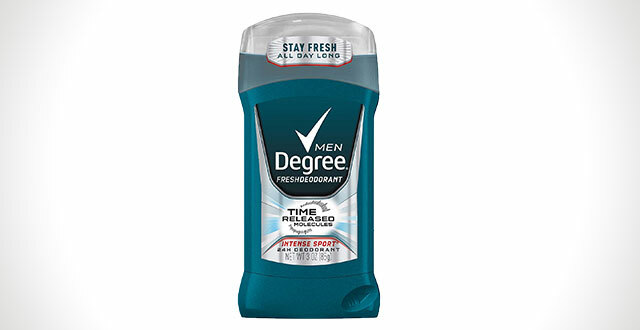 Degree is yet another familiar name in the men’s personal hygiene department. In fact, it takes the place as one of the most popular brand out there for its great track record. Almost 2,340 customer reviews – most being positive testifies to this. The smell is quite potent and pleasant, it’s in no way harsh on the senses. One thing about this Degree deodorant is that it can double up as a unisex deodorant well despite the label. The six available scents: Clean, Cool Comfort, Cool Rush, Extreme Blast, Power, and Sport scents are not distinctly masculine. The highlight of this one in particular is the fact that it is ‘Heat Activated’. Which is a blessing for the active men who lead an outdoorsy life or works on physical jobs. The more you exercise yourself and the more body heat you produce, the deodorant’s mechanism will release more perfume as a result. This is probably the factor that made Degree so popular in the first place. Though the deodorant only provides 12 hours protection – which is considerably shorter than the previous products we’ve introduced. However, its status as an antiperspirant will help your underarm stays dry for the majority of the day. If you’re not prone to sweating a lot, the effective time can easily exceed 12 hours and bleed into 24 hours. Degree contains Aluminium and Zirconium, but, just like Gillette, they’ve done a good job at ensuring that yellow stains won’t appear. Many customers are pleased with this tiny aspect. It also protects your clothes from having awkward white streaks on it, which will improve your image greatly. 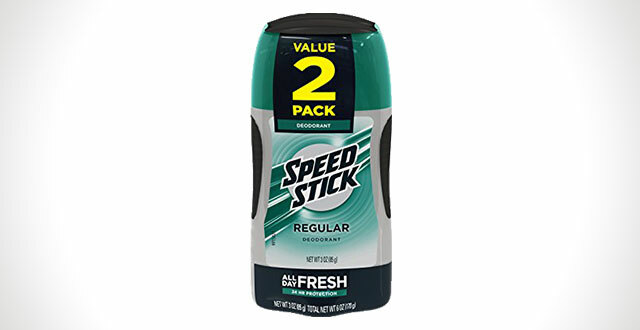 The deodorant comes in the form of a 2.7 oz stick. And the compound is waterproof, so even if you come into contact with water, it won’t easily be washed off. A pleasant smell – not too empowering. The effective time is short. 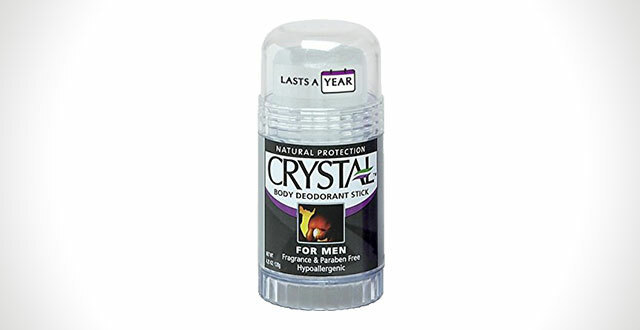 Unlike other deodorants with flavourful and fancy smells, the Crystal body deodorant foregoes all of the unnecessary perfume. Instead, it sticks with nothing at all. This is the most enticing feature of Crystal, and maybe even its downfall. By removing all of the preconceived notion that a deodorant must be pleasantly scented, they managed to focus on what’s truly matter. That is the cleaning and odour protection power of the deodorant. Additionally, the lack of scent isn’t that bad when your distinct smell can be a signature of yourself. But some may be averse to this idea. The deodorant can last up to an entire day without you having to worry at all about body odour. Although it will depend more on your body (How much you sweat) and the intensity of your activities for the day. But beside the unique odourless property, the other best thing about Crystal is that it is completely organic. It is not easy to find a deodorant that is not synthesised entirely from chemicals such as Aluminium, Zirconium or associated chemicals. Instead, the Crystal uses mineral salts to make your skin odour free and lively. For its size, the deodorant is very long lasting. If you follow recommended dosage, it can last an entire year without you having to replace it. And that is quite a relief when you take into account that for everything that it offers, Crystal is extremely expensive. Along the line of some $40 – $45, for a single unit, you can buy packs of chemically formed deodorants / antiperspirants. But the values that it gives far exceed its price. If you have the money to spare and the needs, this can be considered to be the best all natural approach to personal hygiene. Has strong odour protection capability. For some, the lack of odour may be a turn off. Sometimes pleasant smell or great odour protection isn’t enough, for those who take activity to extremes, you would want something that is durable. The Old Spice is the best solution to this at the moment. Even with that said, Old Spice neither forewent smell nor odour protection. In fact, it has a very refreshing smell, and surprisingly, quite sophisticated: A mixture of herbals. Unlike other deodorants which go for a multitude of complex, synthetic, chemical smell. 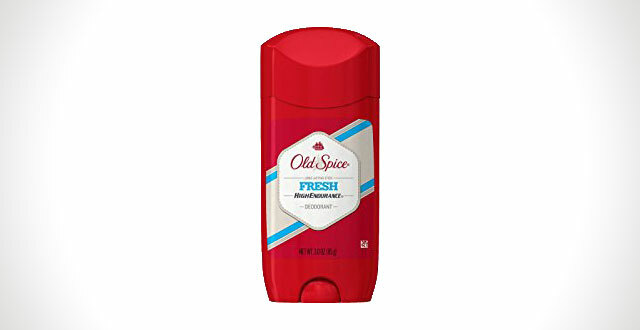 Old Spice, much like its name prefers its product to have the signature spices in its name. The odour protection system is along the average range, aims more toward those who don’t sweat much but still would like to smell great. Its effective time is among the range of 12 hours, but as always, realistically it depends more on your body and your situation. The highlight of Old Spice is – of course, its endurance. The advertisement is quite lousy: “Even if you stood in the blast radius of a nuclear bomb, this stuff would not stop working.”. We have quite a good idea on how much they prided on its endurance. And even though it cannot withstand a nuclear blast, it does last a long time and through various conditions. In fact, a major proportion of the reviews are favourable towards its endurance. Some even noted that after work shifts and long days, the deodorant is still effective. It does not seem to contain Aluminium, which means that it’s not an antiperspirant. So if you’re one to sweat a lot, you should ponder very carefully before buying this. It might not work as well as you would expect. It comes in the form of a 3 oz. Stick and will be enough to last a couple months for a single unit. Very exotic and sophisticated smell. Aluminium less, which is both a pro and con – since it won’t stain your clothes and won’t jeopardise your health. Since it lacks Aluminium, it is no good in anti-perspiring. So if you sweat a lot, you’re going to have troubles using this. Now Speed is not that much of a popular name, but still, for the small audience who consumed it, it is a good product. Though it cannot be as popular as Degree with thousands of positive reviews. Speed still managed to have 146 mostly positive reviews to prove its worth. Speed does not stress a lot in the scent department. Although its scent is barely noticeable, it still gives you an aura of cleanliness. The scent would act more of a suggestion of your personality and you would come off as more subtle that way rather than upfront. Much like the Old Spice, Speed gives especial attention to the less demanding audience being those who don’t generally sweat a lot. The odour protection property can only last 12 hours at most, and depends on individual users, it can last a bit more. But the consensus is that the odour protection is greatly underpowered and it may not be as long lasting as you would expect it to be. Take it with a grain of salt. Speed does not include Aluminium in its ingredient list, so therefore, it will make this product a pure deodorant instead of antiperspirant. This can irritate some people’s skin. It will also make those who sweat or more active has less of an experience than those who are opposites. And since sweat is still produced freely, this will hamper the effective time of the deodorant even further. Consider your body first before making a purchase with this one. Speed comes in a pack of two 3 oz. Sticks, and if you moderately use it, a single purchase can last an entire year. Which is pretty good value for the bucks. A very faint, subtle scent. Aluminium free makes it stainless and won’t affect your health. Lacks of Aluminium makes some people who sweat more than others has a worse experience with the product. When it comes to being affordable and all natural, the Mountaineer beats Crystal by quite a margin. Not only it smells more exotic and pleasant (A personal opinion). It also comes in a variety of unique scents that it’s going to blow the Crystal out of the water. The first thing we should talk about is the fact that it has three scent options. Lime and Sage, Timber (A mixture of Cedarwood and Fir Needle), and Unscented. That is pretty diverse for a natural product. And especially when compared to the Crystal, which only has a singular, fixed scent, it’s a total triumph. Another large plus in the smell department is that it is completely unisex: Not too masculine nor feminine. It will be the perfect gift or accessory to anyone. Although its odour protection capability is not mentioned, you can probably expect it to last anywhere from 12 hours to an entire day. But when you consider the fact that it’s mostly natural, it’s probably among the range of 12 hours. One of the best property of the Mountaineer is the fact that it can detoxicate the underarm. By purging the collected Aluminium and chemicals residing within the pores from past chemical deodorants, it’ll make your body a much healthier place. The ingredients are all natural, not only means that they’re completely safe for use and would be pleasant on the skin. It will also mean that you won’t have to deal with chemical stains on your clothes after use. And for the price that it is at, the Mountaineer is a steal. In comparison to the Crystal $40 – $45 price tag, the Mountaineer only comes at $9.75 for a 3.25 oz bottle. It is a much more valuable buy for sure. Available in three scent options, all unisex. The scent can be extremely strong for some people. 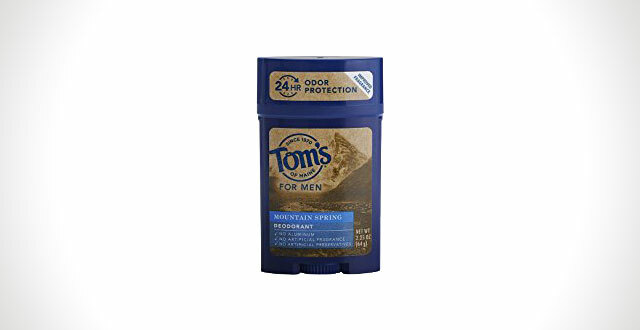 Following the footsteps of the Mountaineer and the Crystal, Tom’s of Maine also partakes into the small industry of natural deodorants. And while it does not bring more to the table than the Mountaineer and Crystal, it still holds its own value pretty well. Just like the Mountaineer, Tom’s of Maine is available in three different scents. Those are: Deep Forest, Mountain Spring, and North Woods. Granted, they’re some pretty arbitrary names and don’t give much of a sense of how they’re actually like. But you can make some guesses, who knows, the final result may even surprise you. As with any ‘Natural’ scents, they are all unisex. And that’s the cue for a prospect item to buy for a birthday or as a treat for yourself. Unlike the Mountaineer, the odour protection ability is actually tested. Clinical trial shows that the Tom’s of Maine can hold itself for up to 24 hours. A much better statistics even than chemical deodorants. The manufacturer has made quite of a statement on how their product is all natural. Not only so, it is also cruelty free and stayed in boundary of even religious guidelines, such as Halal and Kosher. This expands the audience of the deodorant even further. Since it’s all natural, it won’t be harsh on your skin, nor it will be dangerous to use in anyway. Tom’s of Maine is also pretty luscious on the value side. A three pack of 2.25 oz. Sticks for $13 can save you a lot of money and last a long time on the side. Available in three scents – all unisex. Clinically tested to endure up to 24 hours of effectiveness for a single application. Its effectiveness decreases significantly for those who sweat much more than average. Polo is only known by its fashion line mostly, but recently they have also done some expansions also into the hygiene department. And for what it’s worth, they have done a pretty good job at it. The scent, although is fixed, is a pretty interesting and complex combination. The scent is a very sensual mixture of Patchouli, Gernium, Amber and Melon that can effortlessly act as a cologne to boot with its deodorant ability. The fragrance in itself is the highlight of this particular deodorant and is praised by nearly all of the customers who had brought it. It is important to note that this is not a deodorant used for intense activities, but more for a casual, evening application. One that you would count on to have your back in a date instead of spending outside in the Sun. It is also important to note that it is not an antiperspirant, but a pure deodorant. It lacks the necessary Aluminium for good anti-perspiration magic. But as said, this is not something you would wear while working or exercising, so it’s pretty understandable. 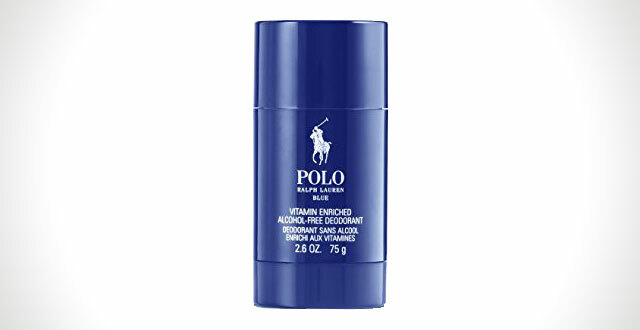 Polo is a pretty known fashion brand, so you must also pay quite a premium for this deodorant. Clocking in at $19, it is arguably the most expensive in term of value-versus-functionality. It may be unacceptable for some, but for those who have the money to spare, it is a good buy. Potent – can act as a cologne. Expensive, and doesn’t really live up to what’s expected of it. For men, spending the day out in the Sun is taxing both on our physique but also on our personal image. Having body odour is the last thing you would want when you’re mingling with others. These ten options may help you considerably in your path toward a better image of yourself.